Peel and stick back splash tiles are an easy DIY upgrade for your kitchen that even a beginner tiler can accomplish! DIY renovation is a family affair. With our own house projects starting to wind down (ok, not really), I thought it would be nice to share a project from our family. In fact, our entire extended family always has some sort of project going on. Maybe it’s genetic, HA! Anyways, my husband’s brother has been on the hunt for just the right backsplash to complete his kitchen. Last year, at a conference, I heard about a stick on backsplash tile from Aspect Tile. They gave me a sample and I shared it with my brother in law. Although they have real metal, stone look, and glass tiles in many different colors and shapes, the storm cloud 3×6 peel and stick backsplash glass tile was the one that felt right. After our own kitchen renovation where we tiled our backsplash in traditional mortar and grout way, I wish I had known about this peel and stick backsplash tile. I have heard some mixed reviews about other stick on tiles but these look like the real deal. 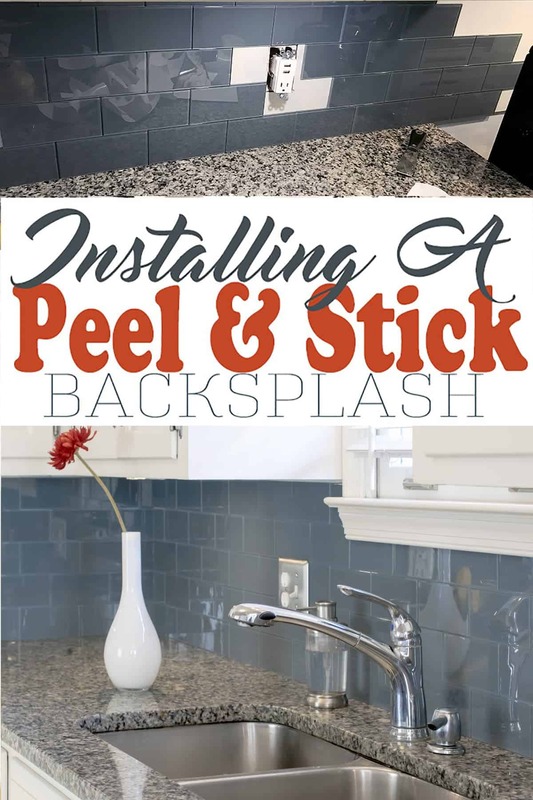 Today I thought I would take you through installing peel and stick backsplash tile and reviewing how it has held up. This DIY project really changed the whole atmosphere of the kitchen giving it a modern and sophisticated feel. As with any DIY project, surface prep is always key. Due to surface imperfections and wear, they started by putting up a thin backer board and then primed it. For most, this wouldn’t be necessary, and I recommend watching this video before starting. I also recommend reading the generous FAQ. The largest consideration to make before you make your first cut is to make sure your cabinets and counter top are completely straight relative to each other. Even a small difference can be noticeable unless you plan ahead. Measure at both ends and the center to see if there are any differences in height. Level – we love our 4 ft level! TIP #1: While you won’t make a nasty mess like you do with mortar, I still recommend putting some towels down on the counter top and under your tile cutter to catch any glass fragments from the cutter. Always lay out the pattern before applying it to the wall. It’s just good practice, and the backing is very sticky so it is not easy to remove. Aspect Tile recommends painting the wall a similar color to the tile in the event there are any gaps. Because the cabinets and counter top were straight and level, there were not issues with gaps in our installation. TIP #2: Use a dry erase marker to draw your cut lines. It is easy to see and you can wipe it off right after cutting the tile. With a simple glass cutting tool, the tiles are cut fairly easily around outlets and corners. For intricate cuts, we did end up using a wet saw with a diamond cutting blade with no issue. The peel and stick kitchen backsplash has now been up for several months and is holding up very well. It is easy to clean and no tiles have fallen. During installation, 1 tile was cracked when the outlet plate was screwed in a bit too tight and he plans to replace that piece. It would be impossible to patch a regular mortar and grout tile, so this glass tile seems very forgiving. I know that they love how it turned out and I think it’s just beautiful! 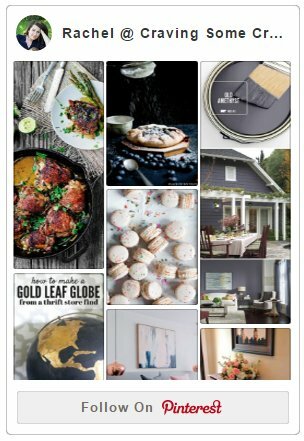 Or subscribe to Our Newsletter Below for more DIY Ideas, Recipes, and Seasonal Crafts! Now that the backsplash is done, they are already talking about redoing the cabinets. DIY can be addicting, right? Well, at least it feels that way in our house. If you are in the market for a new backsplash or accent and don’t want the hassle or expense of traditional stone or glass tile, you might want to consider taking a look at this product. Great Design I’ve been thinking for a kitchen upgrade for a long time but couldn’t find a nice idea but this looks Amazing! I will surely implement this on my Kitchen. I have some of those tiles that I received free from the Haven Conference, I still need to use. I love the color, its beautiful, and you did an amazing job. You said you used a diamond cutter, is that easy to use. It’s basically a wet saw but it has a blade on it specific for glass. I have used them several times and, while messy, it isn’t hard. I recommend using a towel underneath to keep most of the mess and tinyist bits of glass at bay. We only used this on the intricate cuts like around the outlets. Straight cuts were easier with the glass scoring/cutting tool (and no mess). Holy smokes! What a difference that tile makes! I used the white version in our powder room and it’s perfect. It looks awesome! I’ve been wanting to try this stuff in my powder room, I need to get on that!! Oh, I bet it would be pretty in a bathroom. But I can totally understand. I have a million projects I would like to get to…one day, lol! This came out beautiful! I have a box of that exact same tile waiting to be installed in my niece’s house! haha, great minds think alike! I love the blue they chose, but the metal tiles are also really cool. I was thinking of using them in the bathroom.